There is no better way to start the day with a really great morning or to brighten a gloomy afternoon than to have a cup of perfectly prepared hot coffee that has an aroma that can definitely calm your senses and condition your mood just by the smell of it. What is more relaxing is that, when your favorite coffee blend is so easy to prepare, right? To those who love their coffee to be especially creamy, you should really try the NESCAFÉ 3in1 BROWN ‘N CREAMY variant. 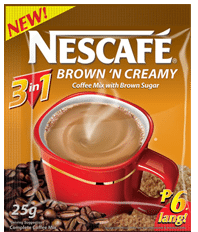 Aside from the fact that it is a product of Nestle, which has been bringing “Good Food” and Good Life” through the years, this variant has a delicious blend of your all-time favorite NESCAFE and a perfect coffee creamer plus it has a distinct sweetness of brown sugar that you will surely love! Now, why settle for that average coffee and do the extra effort and waste your precious time preparing for your favorite blend of coffee and manually mixed it with a creamer and sugar to suit your taste when you can prepare it as easy as 1,2,3? One, get a cup of hot water, two, open the NESCAFÉ 3in1 BROWN ‘N CREAMY and put it in a cup of hot water and lastly, three, stir! That’s it! You’re now ready to take that wonderful sip of hot, creamy coffee that you really desired for. As for you, my dear readers who are coffee addicts, Nescafe is excited to bring you a simple and easy contest. How? Simply profess your love for the NESCAFÉ 3in1 BROWN ‘N CREAMY by sharing it on the comment section of this post (found at the bottom). The reader with the most creative/unique answer will win a Nescafe 3in1 gift pack of his/her choice plus a limited edition NESCAFE notebook. I’ll be announcing the winner next week along with the next Nescafe promo. So, what are you waiting for? Show us how much you really love NESCAFÉ 3in1 BROWN ‘N CREAMY! NESCAFÉ 3in1 BROWN ‘N CREAMY is available in 20g sachets, Bag of 10 sachets, Bag of 30 sachets. Please visit and like Nescafe’s Official Facebook Page to get new updates on their products and promos. My tongue loves it bitter! Drinking Nescafe 3in1 Brown "N Creamy plus my favorite pandesal really starts my day right. It was like waking up on the right side of the bed and having it as a lucky charm for a great morning until the end of the day! I grow old just drinking non other than Nescafe, I can say that this is a must on every household grocery, it’s a good start to kick off every morning drinking instant coffee of Nescafe 3 in 1 especially brown n creamy. i just love it! My day start with a cup of Nescafe 3 N 1.. I so love it that even I migrated here in Sweden I still buy them in the Asian Store even though it a bit expensive..
My love for coffee is like a passion in life. I always remember my father told me, “what is coffee if it doesn’t taste coffee?” since then, i always wanted my coffee extra creamy and that’s were cream was always twice than the regular serving but of course, i like it brown. Considering the thought that we need to take care of our health, brown sugar has always been the choice of sugar in our family. Nescafe has been a part of my daily life since i have started drinking coffee and yes I am a confessed coffee lover , that is why when they released brown and creamy version, i said, it’s an answered prayer. Nescafe 3 in 1 is a must for me… I wake up to it, I dine with it, and I can't sleep without having a sip of it. The Nescafe 3 in 1 Brown and Creamy takes my antok away, and wakes me up to a brand new me! It not only wakes me up, but it supports me to perform great job. When face off challenge fall in, it boost my energy so we know who we really are. Under the skin, cheers to Nescafe 3 n 1 brown coffee! Because one of the coolest reason for success, Is substantial amount of coffee! Ever since I tasted Nescafe Brown ‘n Creamy coffee, it has always been my morning companion. I love how rich and creamy the coffee taste like, and even on a hot morning, I look forward to drinking it because not only does it complete my everyday ritual, it also comforts me. I think there’s nothing, not really crime, more in opposition to poetry, to philosophy, ay, one’s itself than this incessant business. I love the taste of nescafe 3 in 1 brown and creamy, it really makes my day complete from my morning time till bed time, nice to drink while having fun with my kids and taliking time with my hubby, it really makes sense. how I love it. I really love, like Nescafe 3 n1 Brown N' Creamy, ever since I drink coffee I choose this, I am drinking 2 to 3 times a day because, after you drink it makes my self calm, relax, easy and too delicious to have it everyday. I have it 1 bag of Nescafe 3 n 1 brown N' Creamy 30's, and if it consumed I buy again, Brown N' Creamy rally so good for me, I love the taste ever. So my question is that is it good to drink more times a day of this coffee? I love Nescafe Brown N' Creamy. I really look for Nescafe 3 n 1 Brown N' Creamy every morning. its either before breakfast or during breakfast. If I cant drink Nescafe it makes my day incomplete.